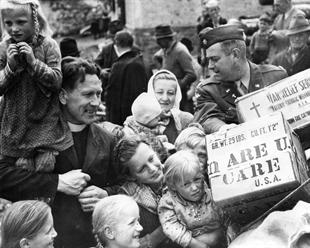 In 1947 Americans fed a “silent guest” during the holidays and this led to a CARE package going overseas to feed the hungry. Writing is like a bridge to other worlds. It can take you to a land far away. Or it can even take you back in time. All you need is a pen and your imagination. This combination of writing and history is the best tool I have for taking on one of mankind’s greatest threats: global hunger. Why study history? Because “I like to” to quote former Harvard Professor Frederick Merk. There are great stories as we uncover the past. It’s inspiring. How well known is it that millions of lives have been saved over the years because both citizens and leaders were committed to fighting hunger. Shouldn’t that be remembered and celebrated? History can help guide us through the sometimes treacherous waters before us. The famous Marshall Plan that rebuilt Europe after World War II showed how critical food is for rebuilding a society. Once, a young lieutenant after World War I was told that getting food to the hungry trapped in a valley would be impossible. His response was “yes, we can” and his team got it done. That is the spirit that must remain timeless. My writing adventure against world hunger started when I was finishing a graduate course at the College of Mount St. Joseph. You know a class is going well when the ideas start coming. Sometimes those ideas divert you from the curriculum, but when it comes to education it’s good to deviate. School is about creative thinking and writing. I was ready to take on a new topic with my writing. However, I did not know much about global hunger at that time. I knew hunger was a crisis both globally and even locally. Today, there are 870 million people worldwide who suffer from hunger. In America there are just over 50 million people who struggle to get food. But quite often it’s not something we see right in front of us and it’s not often covered in the media. These great distances can mean less action. Hunger can be a silent crisis too. The effects of malnutrition are very damaging, and even deadly, to a society. The impact can takes months or years to unfold, or to be realized. Hunger though has the potential to claim more lives than a war itself. To get started, I bought a book about Food for Peace by George McGovern written back in the early 1960’s. From that historical starting block I moved into the present day struggle. I made a great contact with Jennifer Parmelee of the UN World Food Programme (WFP). The WFP is the largest food aid organization in the world. Then I got some ideas. My first article on hunger was published in my hometown newspaper, the Cincinnati Enquirer, on my birthday. I have written hundreds of articles and books about hunger since that time. I even compiled these articles and interviews into several books. With each story I try to take that trip to a distant land or time. Sometimes I do both. Just within the last year I have written about school meal programs (which Charity Miles supports) and have received comments from people who benefited from U.S. led school feeding in Germany after World War II. Sometimes I do my writing in between a Charity Miles workout. I will bring a little notebook and stop somewhere and jot a few things down. Last week I took a break at the College of Mount St. Joseph library and found a historical book about the International Red Cross. I read about how they provided school meals to children in Hungary during the 1956 Revolution. A good idea would be if someone could write a paragraph or two about their interests and talents. Afterwards, you would write down how those same parts of your life could be used to help end global hunger. If you use Charity Miles you already have one such idea to write down and develop. The great thing about Charity Miles is that you can fight hunger both at home, by supporting Feeding America, and abroad by helping WFP. On some days I have run or walked for both. You can probably think of many other ways to help these organizations fight hunger. Think of as many as you can. Then you can start turning those ideas into action. Those words and ideas can lead to many things. I remember a message from an organization called Edesia saying that a newspaper article I wrote led to donations to buy Plumpy’Nut, a life saving food for infants, during the East Africa famine of 2011. You never know what surprises wait around the corner just by writing or diving a bit into the past. Originally published at Charity Miles.